In most cases there is no better tool than a band saw to cut precise curves in wood, although a quality saw does more than just cut curves. It also cuts tenons and smaller rabbets; can be used for resawing thin strips of wood from larger pieces, and for ripping small pieces of stock. But with the variety of types, sizes and options available, how do you know which one’s the right one for you? That’s what we’re here to tell you. There are two principal band saw types : floor standing cabinet models, and shorter models for mounting (either on bench tops or on a dedicated stand). The cabinet models traditionally tend to be used mainly by professionals, while the latter are used by amateur woodworkers, although this isn’t a hard and fast rule. The floor standing cabinet models tend to have both bigger motors, and more features including a strong frame (leading to consistent cutting). Two important things to keep in mind when buying a band saw are: the throat and depth of cut. By ‘throat’, we are referring to the distance between blade and vertical frame section; this determines the cut’s width that may be finished on the band saw. Typical free standing cabinet saws’ throats generally exceed the 12-14” throats of smaller bench top models. Remember: whenever you see the phrase “18” Band Saw”, know that the manufacturer is alluding to the throat measurements. The second important thing to remember as mentioned above is the saw’s depth of cut which is the distance from the table to the upper blade guides. The promotional campaigns of many of today’s saws are based on this feature alone, which basically indicates the stock’s thickness level that can be cut through. That said, several cheaper saws can have a riser appended to the unit increasing the depth from a regular 6” to 12”. The size of the motor on the band saw is also an important consideration; many major amateur-based models feature a ¾-1 horsepower motor, while professional models have bigger motors and variable speeds. But for woodworkers, ‘variable speed’ doesn’t really count for a valuable feature. You usually only use this feature during the cutting of metals and assorted hard plastics. Band saws should come packaged with cast irons; either an aluminum or steel alloy table which can tilt up to a 45 degree angle for angled cuts. This table is usually about 16”x16” and comes with a miter track. Keep an eye out for band wheels with tires and cleaning brushes, to ensure the cleanliness of the wheels. Also keep any eye out for units with built in dust collection ports, for easily linking up to your existing shop vacuum. Two great features you might want to add to your saw, provided they aren’t already included, are a miter gauge and rip fence. Both of these prove extremely helpful during resawing, ripping and cross cutting. During the set up of your band saw, ensure that you have read the instruction manual closely and diligently. Mainly because there are often fine tuning adjustments required to ensure the saw cuts as it’s supposed to. If you don’t closely follow the manual, this might end up degrading performance. So reading the manual is worth the effort; you’ll have a cleanly performing power tool. Band saws are great and fun tools to add to your workshop…provided they’re used correctly. 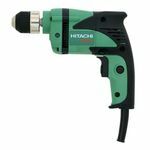 If you’re looking for a smaller-than-average, basic, mid-priced, lightweight power drill that is both easy to carry around and use for continuous drilling, you can’t go wrong with the Hitachi D10VH Corded Power Drill . It also comes with a 5 year warranty which is a feature that you don’t often see anymore. Note, however, that it comes with a 5 year home use warranty.
" One of the most popular woodworking projects, for hundreds of years is the simple “Sitting Bench”. The bench is easy to make, can be used inside and outside for person or commercial uses and when finished makes an attractive and useful piece of furniture. In homes, in recent years, the sitting bench is seeing revival because it is such a useful item and lends itself to the kitchen, the living room, the bedroom, the entry and almost any other part of the house you can imagine. The sitting bench we have constructed here is made from something called Cedar of Lebanon or “Cedrus Libani”. This species is native to the Mediterranean but is also introduced in some more temperate areas of North America where it is grown as an ornamental tree because of it's faster growing characteristics. The main feature of our sitting bench is to have been able to “book-match” the top or seat of the bench just at the point where the sapwood and the heartwood meet, creating a beautiful contrast in wood tones. We were also fortunate to obtain some 2” thick wood from the same tree that allowed us to make the legs for the bench without having to laminate thinner woods together. Our sitting bench design is attractive and useful and will provide years and years of accommodation for relaxing ones wearing bones. The version we have put together here is made without any mechanical fastening devices (no nails, screws, staples or pins). The unit was entirely put together with glue, which will hold it securely, under all normal use for many, many decades to come. We also wanted to incorporate a bit of “character” into the bench which is why we selected some pieces with knot holes. We also rounded over all the corners on both the top, sides and legs so that even with constant use, there is little chance of anyone bumping themselves on a sharp corner. Whether you are an iPhone lover or hater, they are everywhere! The type of phone you have is obviously irrelevant for woodworking, but in case you are one of the many people who hold an iPhone daily, there are a number of applications (apps) that can help you with your woodworking projects. 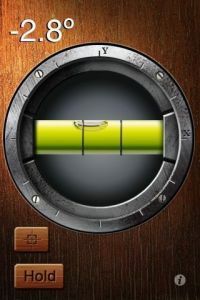 Software for these apps can be easily purchased through the Apple apps store and that can be done directly on the phone itself, or through iTunes on the user’s computer. Purchasing and downloading an app is incredibly easy and feasible as the cost is minimal (some free, and the majority being around $0.99) and takes mere seconds to download to your handheld device. As I looked through the Apps Store on my home computer, I thought I might show you some of the woodworking related applications I have found that you might find useful to your woodworking adventures!